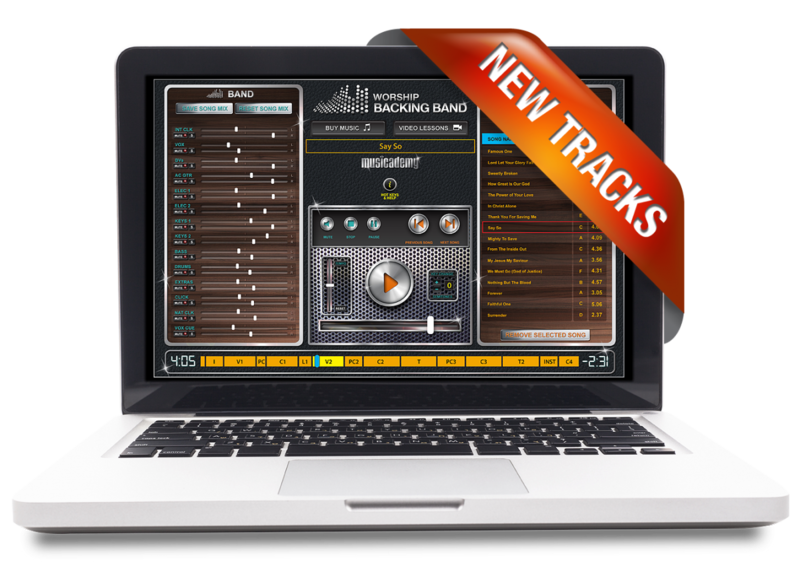 Today Worship Backing Band launches 11 new MultiTracks suitable for our MultiTrack Player, Ableton or any other DAW. Click on the links below to purchase any of the songs. Buy at least 10 tracks in the same transaction and you’ll enjoy a bulk buy discount. In this article Andy shares the thinking behind the arrangements and recordings of each of the tracks. This was an interesting song to produce, as it’s a lovely example of an old school style simple worship song but there isn’t one definitive ‘studio’ arrangement that most churches use. It’s also the type of song where an instrumental section is extremely useful to use for reflection and personal worship but you can’t make the section too long as you may lose people. So we recorded it in an easy play key, built the instrumental, tag and bridge sections in such a way that can be looped for longer times of spontaneous worship, played just once or even cut out all together for a shorter version. We kept this track fairly close to the Phil Wickham version as we felt it was slightly more congregational than the Tim Hughes version (they both wrote the song) but took it down to G to make it more singable for more people. This track was a real challenge to produce as there are so many versions of it out there. There are also the various different commonly used chord structures, and some denominations use different verses or even different lyrics within the same verses! Plus, we wanted to try something that was congregational yet band friendly and would fit hand in glove with the rest of the Worship Backing band material. So, we hope you like the version we’ve woven together here. It’s got big uplifting verses, small reflective verses, some nice band link sections and some short instrumental sections at the end you can use for spontaneous worship (or jump and cut out in the player if you prefer). This track is closer to the Kari Jobe version than the Bethel version but with a number of changes to make it more congregationally useable. We’ve changed the key to A to make it more singable but crucially alternated the song structure quite a bit as the original is nearly 13 minutes long! Our version is still over 6 minutes long so it still encompasses the big and small chorus and tag sections, but we’ve built it in such a way that you can jump around each section to your heart’s content to make the song as long or short as you like to suit your congregation. This track, like a number of Bethel songs is singable in a variety of keys but has needed little bit of modification to the structure and arrangement as many of the definitive versions are too long to be useable for the average congregation. So like ‘Forever’ we’ve kept the important big and small versions of each section but built the arrangement in a way that you can jump around to make the song as long or short as you like to suit your congregation. This Matt Redman track is a really usable worship song so we’ve kept the structure pretty much to the original but brought the key down to A as it’s often a bit too high for many congregations to cope with. There are a few versions of this track around but we wanted to be closer to Michael W Smith’s slower version as we felt the tempo better reflected the theme and lyrics of the song. That said, harmonically we went with Aaron Keye’s original chord structure (Aaron wrote the song) so the verses start on the relative minor rather than the major root chord, which again adds more tension and helps the music match the lyrics. Again this is another Bethel based song where many of the popular versions are 11 or 12 minutes and too long for most congregations. For our version we put it in a more congregationally friendly key of G, but chose a slightly extended working of Phil Wickham’s studio version where we’ve structured the bridge (“worthy is the lamb that was slain”) into three sections with three dynamic builds. This means you can do the song as it is at a usable 4 minutes 51 seconds long or loop those bridges and choruses to build the dynamic slowly if you want to create a longer version. As per the other Bethel based songs in this batch of releases, most of the best known versions are too long for the average congregation. So, we’ve kept all the parts you need but produced a more usable 4 minute 46 length version that you can jump around as you need to. We’ve also brought the key down to G to make it more singable too. The season to be jolly is nearly upon us and this new Christmas song by our friend Tom Mills is perfect for your own Christmas services. It’s very much a fun, modern, pop style song with a great message too so you can use it as a worship song, performance song, even a kids song as well! You’ll love it! Click through to watch a video of the song.